Whole cell lysates of the shown cell lines were separated by 7.5% SDS-PAGE and transferred to nitrocellulose membrane. 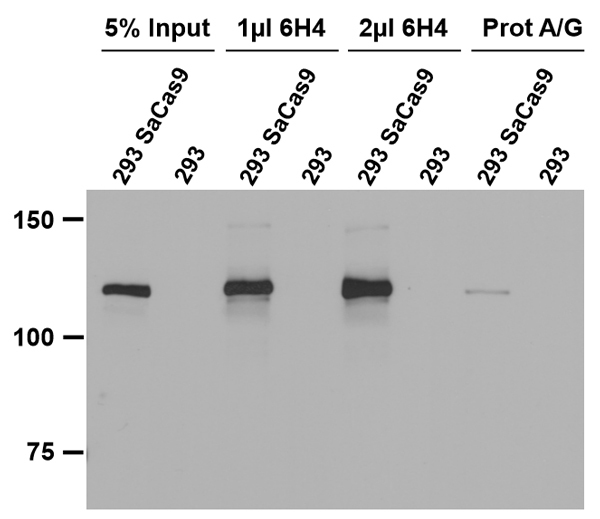 After blocking in 3% NFDM in PBS-T, the membrane was incubated with purified CRISPR/Cas9 (SaCas9) Monoclonal Antibody [6H4] (1:10000 diluted) at 4°C o/n and Cat. #A12003 for 1 hour at room temp. Protein expressions were visualized using ECL exposed to X-ray film. 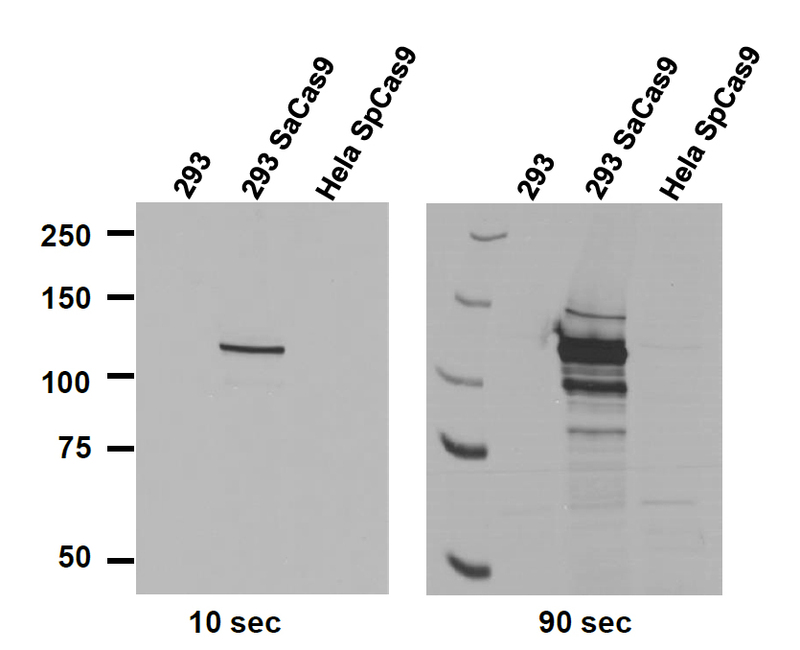 SaCas9 was immunoprecipitated from 200 ug of whole cell lysate of the shown cell lines using 1 ul or 2 ul of purified CRISPR/Cas9 (SaCas9) Monoclonal Antibody [6H4] and a 1:1 mixture of protein A/G beads or with a 1:1 mixture of protein A/G beads alone for 90 min at 4°C. After washing 1x each with lysis buffer, RIPA buffer, LiCl wash buffer, and Tris/EDTA, bound proteins were boiled off the beads with Laemmli buffer, separated by 7.5% SDS-PAGE together with 5% of input cell lysate and transferred to nitrocellulose membrane. The membrane was blocked in 3% NFDM in PBS-T and incubated with SaCas9 rabbit polyclonal antibody (1:10000 diluted) at 4°C o/n. After incubation with anti-rabbit HRP coupled secondary antibody for 1 hour at room temperature, protein expressions were visualized using ECL exposed to X-ray film for 10 seconds. 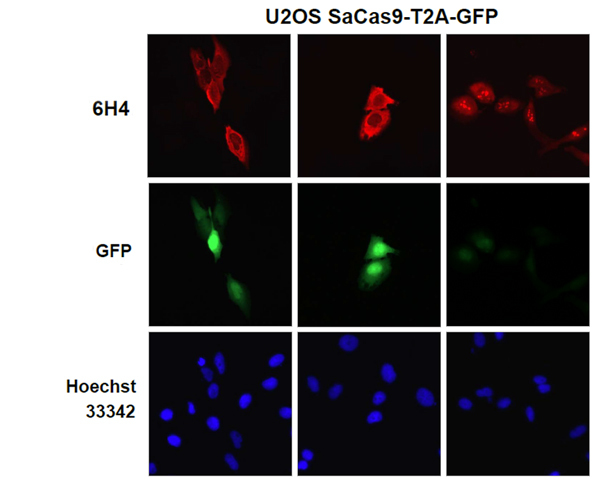 Transiently transfected U2OS cells expressing SaCas9-T2A-GFP were fixed with 3.7% formaldehyde and permeabilized with 0.5% Triton-X at room temperature. After blocking in 2% BSA in PBS, cells were stained with purified CRISPR/Cas9 (SaCas9) Monoclonal Antibody [6H4] (1:1000 diluted) in 1% BSA/PBS at 4°C o/n. After washing, cells were incubated with anti-mouse DyLight594 secondary antibody for 1 hour at room temperature, nuclei were counterstained with Hoechst 33342 and slides were mounted with Vectashield. CRISPR/Cas9 (SaCas9) Monoclonal Antibody, Clone 6H4. N-terminal Antibody. Unconjugated. Raised in: Mouse.